The sports technology world never ceases to amaze me how the timing of a good idea can become a startup and then a sustainable business as might be the case for FantasyBrain, founded by Jonathan Joseph, or J.J. to most. JJ and his small team of sports technologists in the San Francisco Bay area have developed proprietary algorithms that give each user a universal fantasy profile complete with a proprietary F score that is calculated from data generated across most all the fantasy football league providers you play in, including CBSSports, ESPN and Yahoo. Your F score is similar to a Klout score and is based on a scale of 1-100. Fantasy Sports is estimated to be a $2 billion sports business market, something JJ feels is undervalued in today’s digital economy. “Social gaming is a killer app,” said JJ. Joining and using their service is free. The FantasyBrain codes begins analyzing past moves and instantaneously produces statistics and charts for each fantasy player taking into account multiple Platforms and custom API’s. Activity each user or league generates is an explicate score based on a comprehensive Fantasy sports history breakdown. The three measured criteria are: Start/Sit, Draft, and Transactions. I asked why he founded the company and JJ responded, “Fantasy football has around 35 million players.” Together with his co-founder, FantasyBrain was born because they believe social gaming is Big Data sports business and they feel the timing is right. JJ’s background in venture capitol combined with his partners PhD in Computer Science helps give their executive leadership a unique perspective on how a sports tech company scales, while staying profitable. Their goal is to restructure the game of fantasy sports. Another long term goal JJ has is to be a General Manager in the NFL. After doing his due diligence, he researched and found out there is no clear football path about how to become one of the 32 GMs. Instead, he thought why not build a product that measures how well his fantasy team achievements are so he could compare that information with others to see how he fares. JJ also reminded me how lucky it is to be in a good Fantasy league where you play with others who draft well, activate on time, and make good free agent moves, all season long and even if their team is in last place. If even one person out the 12 or 10 owners does not do their weekly work, the entire balance of the league suffers. If 2, 3, or 4 or more owners stop playing, the league integrity is shot. FantasyBrain wants your F score to be hard earned with a high-level of accuracy. JJ visualizes a time in the not so distant future where you can search for FantasyBrain players to compete against by sorting through F Scores in order to mind the right match. You may want to play in a league full of players who score in the 80’s ,or perhaps you’re a rookie and feel that the 30’s is the best bet for having fun while learning the discipline. I signed up at the FantasyBrain web site via their simple Facebook login interface. You can also set up your Twitter user name under settings. It asked me to pick a favorite team so naturally I selected the Seattle Seahawks. To my surprise, I had a top F score of 74 based upon the CBSSports League history of my team, Sports Techie. Users are able to compare F Scores with: My Rivals, My Followers, other Leagues, and fans of your favorite team. After three weeks, my F Personal Score Summary broke down as the following: Start/Sit 76, Draft 100, and Transaction 45. Interesting to note that after week one, I scored a 55 and it was not until week two that my team started jelling because I scored an 83, and then a 79 week three. In addition, I found out I started the perfect team week two and three. On the bad side, my transactions score of 45 was assigned because of my single cut and then re-pick up of the same player. One other thing I noticed is that our custom league settings allows for playing a TE as a utility starter, however, activating the TE position is not required. If you are not carrying a TE that may work against you as it now stands in FantasyBrain. Other robust FantasyBrain tools that support players include: Roster Advisor, Trade Advisor, and, Who Do I Start (WDIS). The WDIS chat room discussions on the Home page are there for you to engage with other owners. Here you can humblebrag about your sic 100 point draft, tease the owner who sat 25 points on his or her bench, or have a heart to heart with others about who to pick up on this weeks free agent waiver wire. There is also a WDIS page for your Fantasy team that has valuable “Insights” about your actions during the week. Social data infrastructure is a core competence of FantasyBrain. They host your data in the clouds allowing you to access the information via anywhere on the web. Next up will be the construction of a new native mobile app for iOS, Android and Windows devices. The FantasyBrain software is built upon Ruby on Rails code. Sports Techie, There are theories that the NFL’s consistent growth correlates with the explosion of fantasy football, with no end in sight. This past weekend’s Monday Night Football game played here in Seattle went down to a controversial last play. Since the Packers lost on the touchdown call, bettors around the world lost anywhere from $150-$200 million on the spread shift. Some 55,000 fellow Fantasy Football owners had their outcomes changed by the last MNF play of the entire NFL weekend, which gave the Seahawks a controversial win but for many others, an expensive loss. 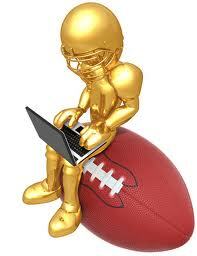 If you do not play Fantasy Sports you might want to give it a go. If you own one or several Football teams, it is time you surf over to FantasyBrain.com and sign up to find out what kind of F Score you have earned thus far. FantasyBrain is not a competitor to providers of Fantasy Sports games; rather, think of them as a compliment to your Yahoo, ESPN or CBSSports leagues and teams. Join in the free public beta test going on at their web site now and begin your lifelong F Score climb to 100 at: http://fantasybrain.com/.